I love slow cooker meals.... and I am learning to use my Instapot more too! Mine isn't actually an Instapot... mine is a pressure cooker from QVC. I love it - same as an Instapot. I have found this great blogger that prepares 10 - 12 freezer/crockpot meals at one time. What a great idea! I would love to have done this when my girls were younger. You have to visit Kelly at New Leaf Wellness. She has such great, easy recipes. She is even trying to convert each recipe to an Instapot recipe. Please visit New Leaf Wellness! I made her Steak Italiano not long ago and we loved it. I love her Cool Ranch Chicken Tacos. I made the taco seasoning and ranch seasoning from scratch... like she lists below. This chicken had so much flavor. I loved it! My hubby loved it. As I mentioned, I am trying to eat low-carb...and this chicken was perfect. Chris put his in corn tortillas and loaded it up with sour cream, cheese, avocado and cilantro. I did the same... but in a bowl without the tortilla. I was sad when it was all gone. This chicken will be a new staple in my house. Cook fresh or freeze and cook later. Serve on soft tortillas, rice or lettuce with your favorite toppings. 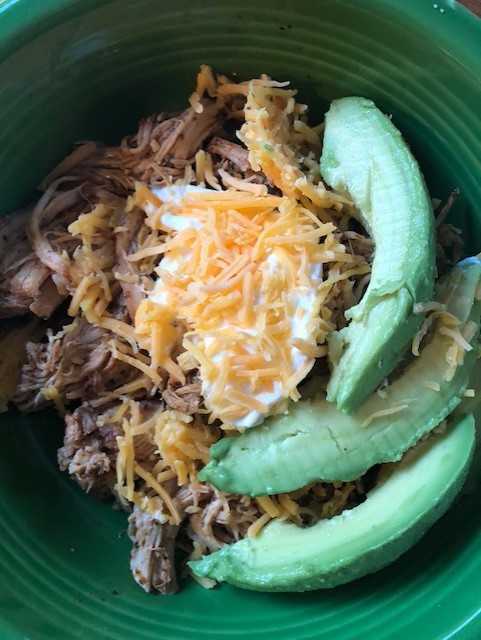 Combine all ingredients in a slow cooker and cook for 6 - 8 hours on low. Use two forks to shred meat and mix with any spices/sauce left in the slow cooker. If choosing to freeze and cook later: Combine all ingredients in a gallon-size plastic freezer bag and freeze for up to 3 months. When ready to cook, thaw overnight in the refrigerator or in the morning in water. Follow directions above.